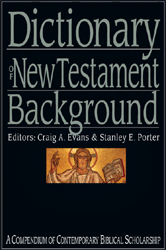 Editors: Evans, Craig A. and Porter, Stanley E.
The Dictionary of New Testament Background takes full advantage of the flourishing study of the Dead Sea Scrolls and offers individual articles focused on the most important scrolls. In addition, the Dictionary encompasses the fullness of second-temple Jewish writings, whether pseudepigraphic, rabbinic, parables, proverbs, histories or inscriptions. NARRATIVE AND PSALMIC WORK (4Q371-372, 539). REBUKES BY THE OVERSEER (4Q477). RITUAL PURITY A & B (4Q414, 512). SONGS OF THE SAGE (4Q510-511). WORDS OF THE LUMINARIES (4Q504-506).